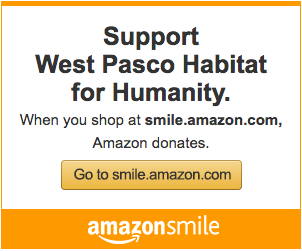 West Pasco Habitat for Humanity : Volunteer With Us! Activities include: Framing, Drywall, Trim, Painting, Landscaping, Site-Cleanup and more. For safety reasons, children under the age of 16 are not allowed on the construction site. We require one adult parent and guardian for every 4 children under the age of 18 on the construction site. Volunteers in the garden will assist with planting tomatoes, cucumbers, lettuces, peppers, eggplant, beets and other plants such as papaya and banana trees. Volunteers are needed in the garden on Monday – Saturday, 9:00 am-12:00 pm. Volunteers are needed in our ReStore Monday, Wednesday & Friday -- 9am to 5pm. Duties include: general cleaning and upkeep of the store, cleaning and stocking donated goods, sales assistance. ReStore volunteers must be friendly, able to stand for long periods of time -- able to bend and stoop -- able to lift, pull & tug up to 20lbs. Please tell us your mailing address. Are you requesting hours for court ordered community service? Please tell us any additional information you would like us to know.